Since its founding in 1991 with 77 students the up-and-coming locations in Wernigerode and Halberstadt have developed rapidly. 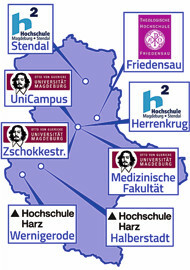 Innovative, practice-oriented degree programs in the areas of automation and computer science, business administration and economics nowadays attract to Harz more than 3,300 aspiring academics from all provinces. The Halberstadt campus is centrally located downtown directly by the cathedral. The city owes its very early role in Central Germany since the beginning of the 9th century to ​​the seat of the Bishops of Halberstadt. They have resided here for more than eight centuries. The population of the city of Halberstadt situated north of Harz today is 42,680.